Lower abdominal exercises are different from most ab workouts in that they involve more of an isometric contraction versus a traditional isotonic contraction like a crunch. Remember, the job of the lower abdominals (transverse abdominus) is to stabilize the pelvis and prevent excessive motion, not necessarily to produce motion at the trunk. So, to exercise the lower abs, you have to approach them in a different manner than the traditional abdominal crunch. Lower abdominal exercises involve a stabilizing contraction of the low abs, and then some type of challenge to the body to remain stabilized. 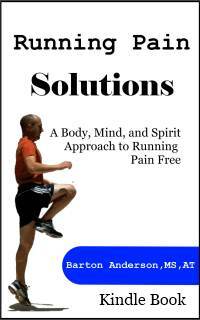 Before we get to the challenges though, we need to find your lower abdominals. The simple way to find the lower abs is to lay on your back, with your knees bent to 90 degrees. Find your hip bones, or the most prominent point of your hip that sticks out in the front. Put your index finger on both hip bones. Now, move your fingers about 1 inch in towards your belly button, and one inch down. 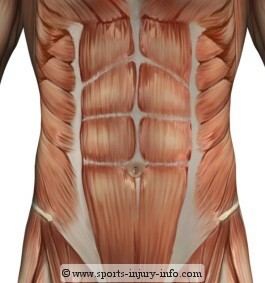 This is where your lower abdominals reside. The next part is a little tricky. You want to try to contract these muscles, but they are sometimes a little lazy. I always tell my patients to imagine trying to get into a pair of jeans that are two sizes two small. You need to imagine drawing your stomach in as close to your spine as you can. If you do this correctly, you should feel the area under your fingers tighten, but not bulge out. If you are having trouble contracting them, try to make your feet as light as you can on the floor. 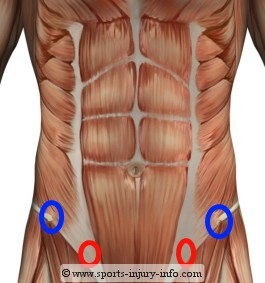 Don't lift them, as this will activate the rectus abdominus. Just think about them being really light. Once you contract your low abs, hold for a few seconds and repeat. Get used to the feeling of having them contracted and drawn in. This is the key to all lower abdominal exercises. Remember, the lower abs stabilize the pelvis. The job is fairly easy when you are lying on your back and not moving. To challenge the lower abs, and to make them stronger, you need to move your arms and legs, or be laying or standing on unstable surfaces. A great way to do this is with a foam roll. You can work your lower abdominals just by laying on a foam roll. Start on your back with your knees bent, and then contract your abs and maintain your balance. As your balance improves, try moving your feet closer together. Once this is easy, you are ready to start moving the arms and legs. Start with moving your arms overhead, alternating right and left. This movement will change your center of gravity, and your lower abs will have to react to keep you stabilized and on the foam roll. Next, try extending your legs, one at a time. This is a lot harder than moving the arms, and will work your lower abs even more. Start with your hands on your chest or stomach, extend one leg, hold for 2-3 seconds, and then switch to the other leg. To make things even more challenging, extend one leg and the opposite arm at the same time. This is an advanced foam roll lower abdominal exercise, and may take awhile to work up to. You can use a medicine ball to make these exercises even more challenging. Getting the lower abdominals to contract is sometimes hard at first. But once you find them and learn to contract them, then the sky is the limit as to how you can challenge them to work harder and stabilize the core. Using a foam roller is a great way to work the lower abs, and is an inexpensive way for lower abdominal training.